Stocks will add to their losses on Tuesday as an obscure security linked to market volatility loses nearly all of its value, CNBC’s Jim Cramer said Monday. 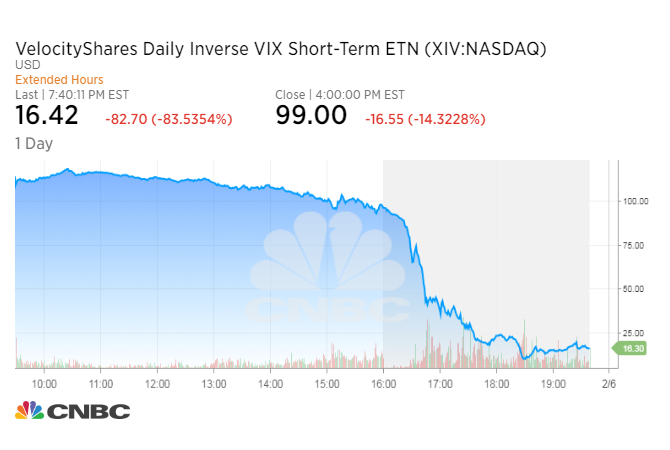 The investor was referring to the VelocityShares Daily Inverse VIX Short-Term exchange-traded note (XIV). The XIV — which allows traders to bet against the Cboe Volatility index (VIX) — tanked more than 80 percent in after-hours trading. The sharp move lower sparked fear among traders that violent declines like this one would cause market volatility measures to spike further and pressure on the broader market. “It should put downward pressure on the stock market at the opening, should spike the VIX to 50 and then cause the market to go down,” he said. The VIX, which is widely considered the best fear gauge in the market, more than doubled on Monday, surging to 37.32 from 17.16 in the previous session. The XIV is supposed to track the inverse return of the VIX, hence the problem. Stocks tanked on fell sharply on Monday. The S&P 500 shed 4.1 percent, marking its biggest one-day sell-off since August 2011. The Dow Jones industrial average pulled back 1,175.21 points. Both indexes erased their gains for 2018. But Cramer also said investors should treat this retreat as a buying opportunity. The major indexes had risen to all-time highs prior to their recent pullback.